It’s easy to forget that time isn’t running out. It’s passing, obviously, but that really isn’t the same thing. There’s a long list of things we collectively think time is running out to accomplish—love, success, meaning. This month, we’ve selected five books to remind you that you’re fully capable of challenging yourself in ways you have never been challenged (That’s the good kind of challenge, by the way. The personal development kind. It’s not the kind of challenge where you try and see how much frozen pizza you can eat without literally dying, which is to say, more than would be helpful. Spoken from experience.) Whether their dream was professional, personal, or more abstract (think ‘to touch the lives of others’), these authors will remind you that happiness doesn’t come with a time limit. Here are five new and upcoming releases to remind you that it’s not too late (yes, not even now). The day Deena Kastor became a truly elite runner was the day she realized that she had to ignore her talent–it had taken her so far, but only conquering the mental piece could unlock higher levels of achievement. In Let Your Mind Run, the vaunted Olympic medalist and marathon and half-marathon record holder, will reveal how she incorporated the benefits of positive psychology into her already-dedicated running practice, setting her on a course to conquer women’s distance running. Blending both narrative running insights and deep-dive brain science, this book will appeal to and motivate steadfast athletes, determined runners, and tough-as-nails coaches, and beyond. This memoir, written by perhaps the most famous American woman active in the competitive world of distance running, will appeal to the pragmatic athletic population, and jointly to fans of engaging sports narratives, inspirational memoirs, and uplifiting biographies. 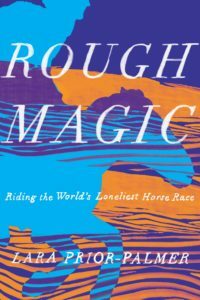 For fans of Helen Macdonald’s H Is for Hawk, this is the extraordinary debut memoir of a young woman who traveled to Mongolia to compete in the world’s longest, toughest horse race, and emerged as its youngest and first-ever female winner. A moving, lyrical, beautifully-written portrait of a nurse and the lives she has touched.